This is my second identical frames with different/new prescriptions. Love them, especially with the cable temples. Now I don't have to constantly push them up on my nose. They stay in place even when I am doing close up jobs and looking down. Glad you're there. I can't find these frames anywhere else. I purchased the Art Craft Art-Bill Rimway with Cable Temples the first week of December, after my glasses were irreparably broken. I was wearing a six-year old pair to tide me over but was unable to read roadway signage or other printed materials, resulting in almost severe headaches. After struggling with daily reading demands, I finally received my frames 27 days after placing the order. They were every bit what I'd expected; a snug fit and the progressive lenses were a great improvement, although it seems my eyes worsened beyond the prescription and I will need to reorder the lenses in order to restore my vision to normal. Fortunately, Frames Direct has a fantastic return/replacement policy and the replacement lenses will be replaced at no additional charge. If you have the time to wait I would highly recommend Frames Direct for excellent service and a price which nobody could beat. To be fair, the holidays and resulting closures probably had significant impact on the protracted delivery time so I will be ordering my next frames from Frames Direct. This was my first mail-order eyeglass experience and I paid less than half what I've been paying at brick and mortar locations. And the service received from Frances was the best! The already mentioned positives I outweigh. Frames Direct deserves a try by everyone. I hope to give them the full five stars on the next deal. Shipping was fast. Produce was exactly what I ordered. 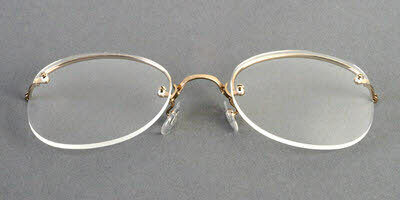 I'd been wearing this frame for almost 40 years when I switched to a new, more modern frame. After a couple years my wife told me she preferred these frames. So I got on the web and found these. They are perfect and the price was perfect. Thank you!